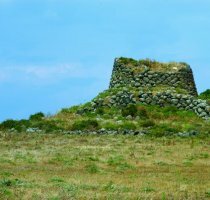 In Sardinia you can find evidence of the nuragic culture pretty much everywhere in its territory, from Alghero to Ogliastra, from Nuoro to Oristano. Hotels in Barumini There are over 8,000 nuraghes, the typical megalithic tower in the shape of a truncated cone. The stones composing each structure are very heavy and make the tower stand by its weight, since there are no foundations. Surely the best example of nuraghe is to be found in Barumini, in the complex of Su Nuraxi. The site is included in the Unesco World Heritage list and is dated around 1500 BC. It is located very much in the centre of south Sardinia but it is quite easy to reach. Hotels in Barumini From Cagliari take the route SS 131 and turn into route SS 197 near Sanluri following directions to Furtei and Villamar. The town of Barumini is just a few kilometres ahead and the site is only 1 km west of the town centre. Approximately 4 km from Barumini the town of Gesturi is well known to be the starting point for a fabulous excursion to the Giara di Gesturi. This is a plateau 12 km long and 3 to 6 km wide that steeply arises from the plain beneath. The top of the Giara is perfectly flat and alternates woods of cork oaks to ponds and meadow grass areas. Typical of the Giara are the Cavallini, an ancient breed of horses. The Cavallini are smaller in size than a normal horse, nevertheless they do not lose any of the typical elegance. Their eyes are peculiar, in the shape of an almond. In the Giara you also find the country chapel of Santa Lucia, many nuraghes, domus de janas and pinnetas. 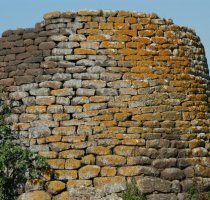 The latter are the typical shepherd's huts, the base of which looks like a nuraghe completed at the top by branches laid down to form a cone.